The Jibun Techo was a planner that I discovered towards the end of last year. I was drawn to the design and the format seemed to offer more than you could get with the Hobonichi Techo. 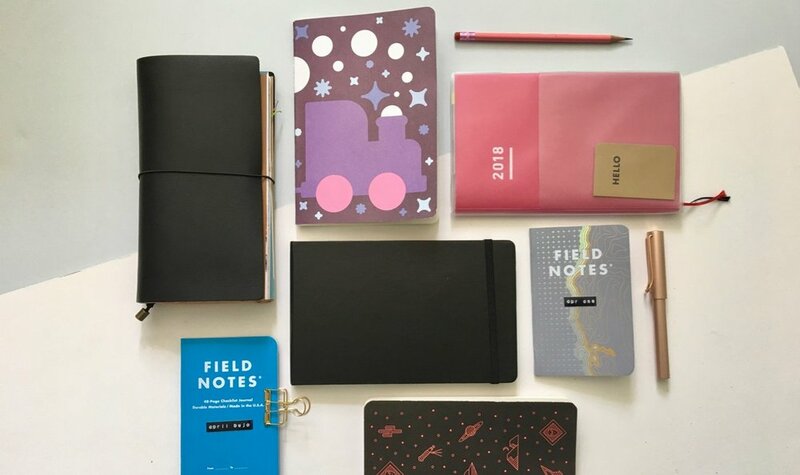 I have been using the Jibun Techo since November and wanted to share my thoughts on the planner and overall system. Planner format and how I’ve been using it. 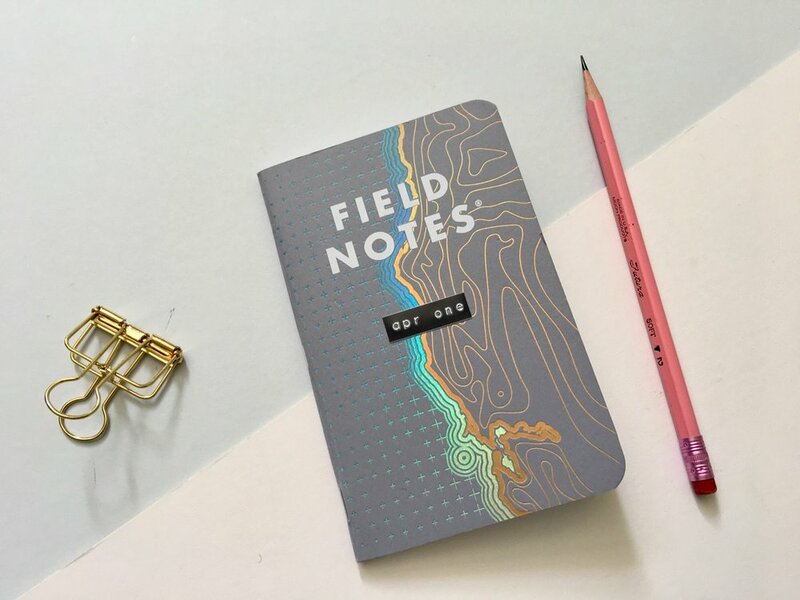 The Jibun Techo has its own format like many other planners but there are some layouts that really set this planner apart from other options available. The Jibun Techo is chock full of ways to record stuff. At the front of the planner are numerous double page spreads but the ones I use are the Book and Movie List. There is space to note down the book/film, the date and your thoughts on the book/film. There are three faces - happy, indifferent and sad - which appear throughout the planner for a very basic record of your views. I also like that there is a blank spread for you to create your own list. I have used this to record the TV programmes I am watching. There are also a series of monthly calendars which two months per spread. I have been using this as a habit tracker. I write out the habits I am trying to improve on and record if I have achieved them. Having this sort of layout built into a planner is really helpful and makes the Jibun Techo a viable bullet journal planner. 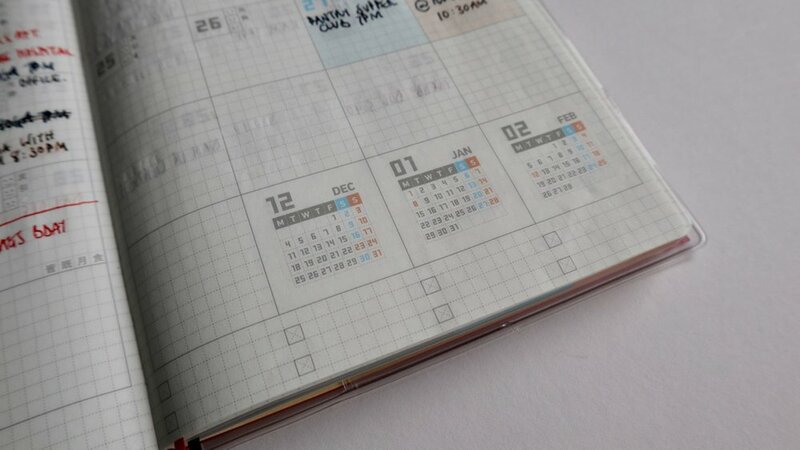 The Jibun Techo includes monthly calendars as you would expect. This starts from November 2017 and runs through to March 2019 giving you some decent coverage. Each month has a colour which corresponds throughout the planner linking your weekly pages, the monthly spreads etc. 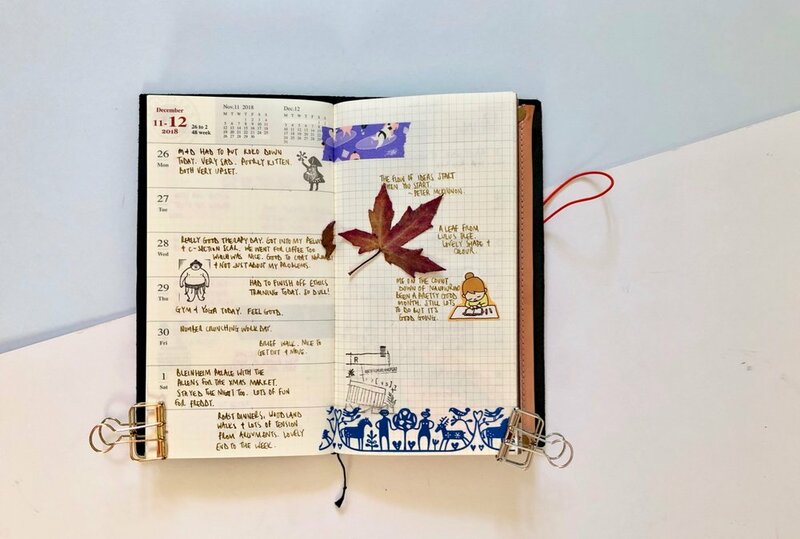 I have been using the monthly calendar to track my appointments, but there are some interesting small extras that make these spreads really nice. The bold type and the colour schemes I really enjoy. It’s nice to see some character in planners rather than a dull monochrome colour scheme. I really like the space to the left of the calendar for your tasks. 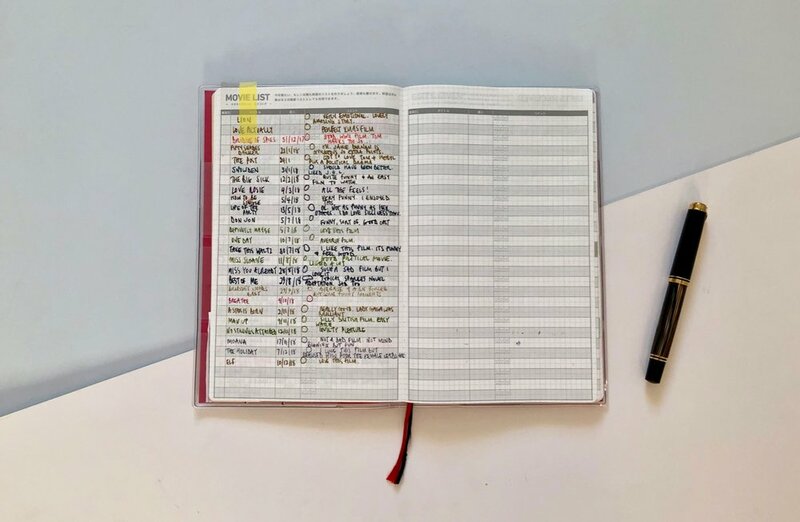 I have found this really helpful to make notes of big events, appointments or tasks I need to take of during that month but that don’t have a specific date. This running to do list helps me plan my month but also gets tranferred over into my weekly pages. There is a also a tiny three month calendar at the bottom of each page which shows you the previous, current and next month. It’s little useful touches such as this that make this planner a real resource. The weekly pages are where everything really happens and where you spend most of your time. Here you can track the weather for each day with the very simple and easy symbols right underneath each date. There is a full 24 hour calendar which means you can track everything. For me it means I can get a good idea of how many hours sleep I am getting, but it also means if you work unsociable hours these spreads are still useful, although the space is a bit more limited. I use the 24 hour section retrospectively. This isn’t pre-filled in with my tasks for the day or meetings that I am due to have. I fill this in during or at the end of the day to record what I did and where my time was spent. There is the same tasks list section on the left hand side of the spread. I use this to write out my weeks tasks, referencing back to my monthly calendar to transfer big items across. At the bottom of the page there is a section to record your mood for the day, write a brief commentary and track your food. Surprisingly I have filled this section in most days and again its quite interesting to review over time and see if there are any patterns forming. The blank space at the bottom of the page I have been using this to record my sons illnesses or days when he is not at nursery. This simple section has been really helpful in seeing information over a period of weeks and the best format I have found so far. 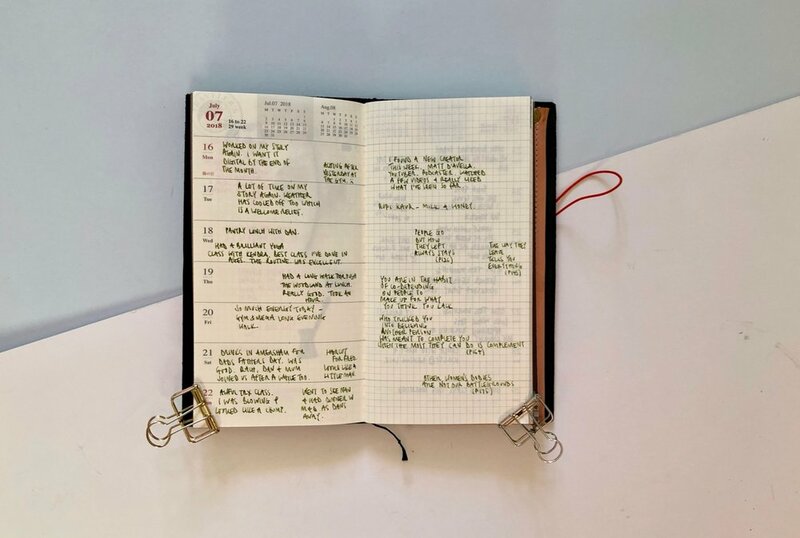 There is a double page spread at the back of the planner which gives you a small amount of space to summarise your month. These are referred to as the reflective pages. It’s always good to look back on a period of time, whether its personally, for work or from a development point of view but finding something that defined your month is a nice idea. Honestly its a page I have deliberated over and found hard to fill in but I think the intention behind this page is really good. The above gives you an overview of the pages and how I have been using them but there are some other specific bits of information that are worth sharing. The paper in this planner is tomoe river paper meaning its brilliant for your fountain pens and ink. I have used nothing but fountain pens in this planner and its really nice to have this high quality paper. It also means its nice and slim because the paper is lightweight. 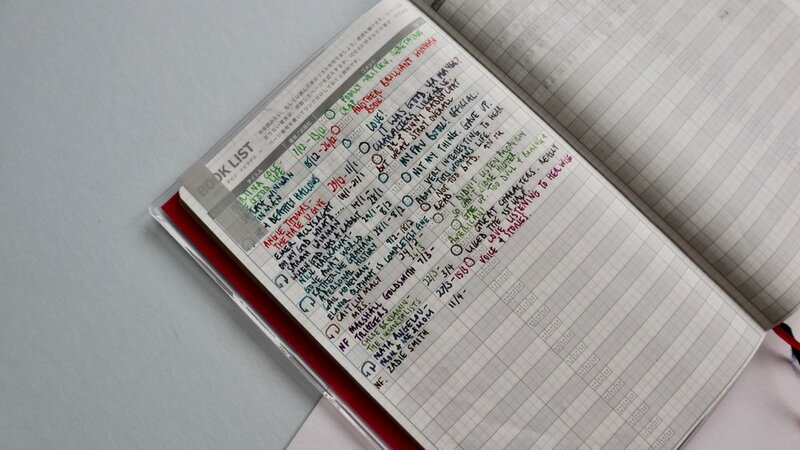 I like the colourful nature of the Jibun Techo. 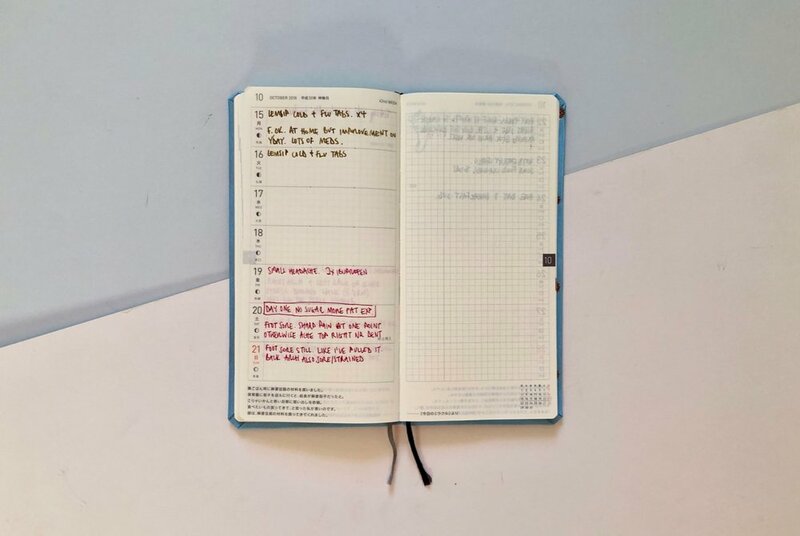 You can get a business version of the planner which basically means its monochrome, but for me the colour in the planner is a feature and makes it more fun. The colour coding throughout means you can link up your pages easily and find information. It is an added element that removes unnecessary thought and makes the planner visual. 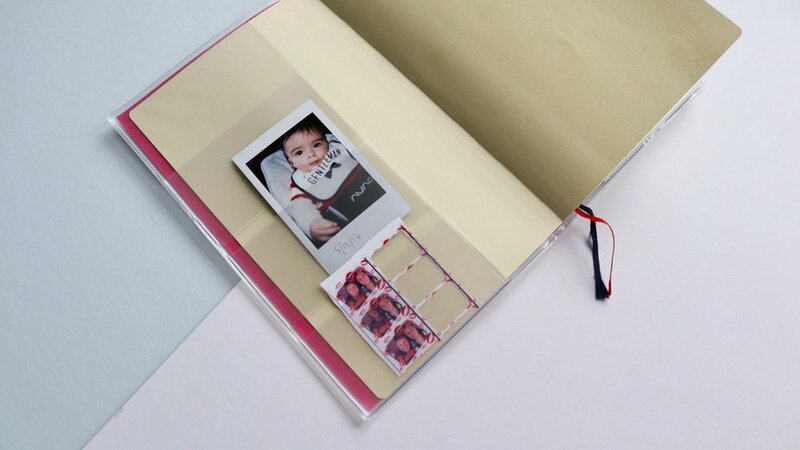 The Jibun Techo ships with a plastic cover which has a tonne of different pockets throughout. 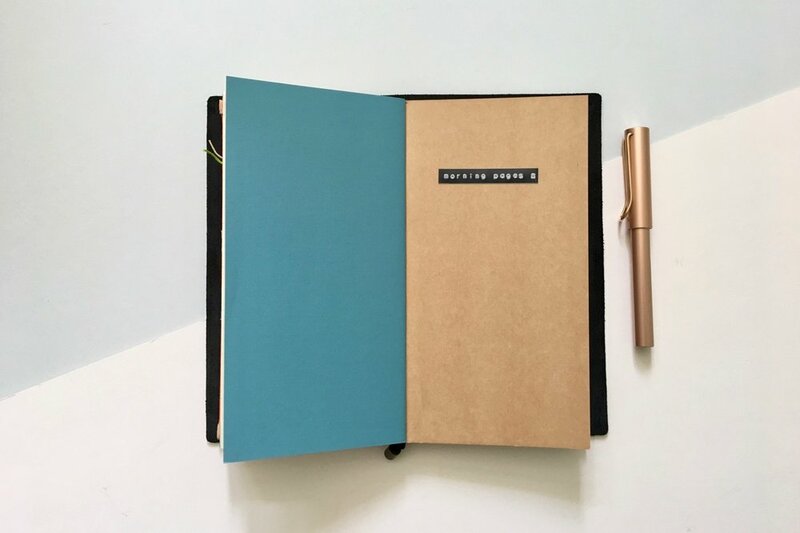 The cover keeps the planner clean but also minimal and slim. The pockets are really handy too. You can decorate this adding in photos or bits of ephemera or simply use it for bits of paper you may need. There are two bookmarks in the Jibun. I use one for referencing my monthly calendar and the other for the current week as these are my most used pages. I have a couple of small sticky bookmarks for my book list and movie list. The habit tracker pages are easy enough to find due to the side colour coding. I also really appreciate the size of this planner. I have the slim A5 as I wanted the additional room, but you can get a slim A6. I was apprehensive about the slim width of the planner before buying but really its not an issue. As planners go I have tried a lot and used them in various formats. 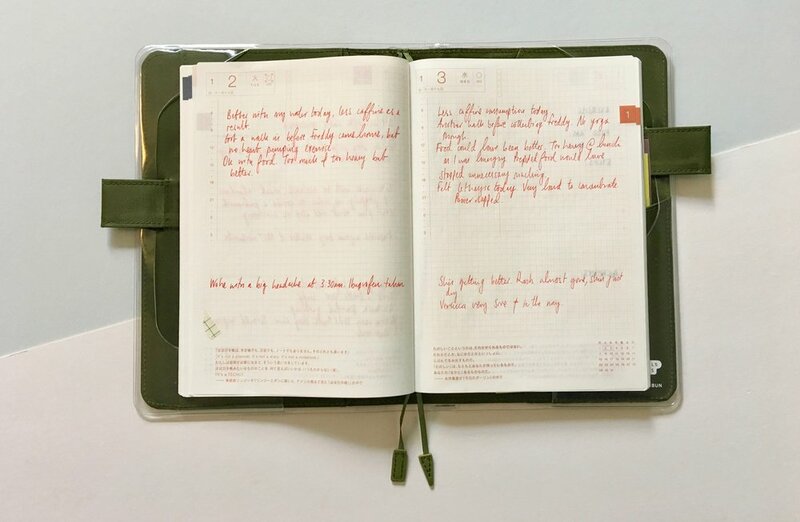 I used the Hobonichi Techo Cousin as a bullet journal, the A6 version as a way to record personal thoughts of my day. 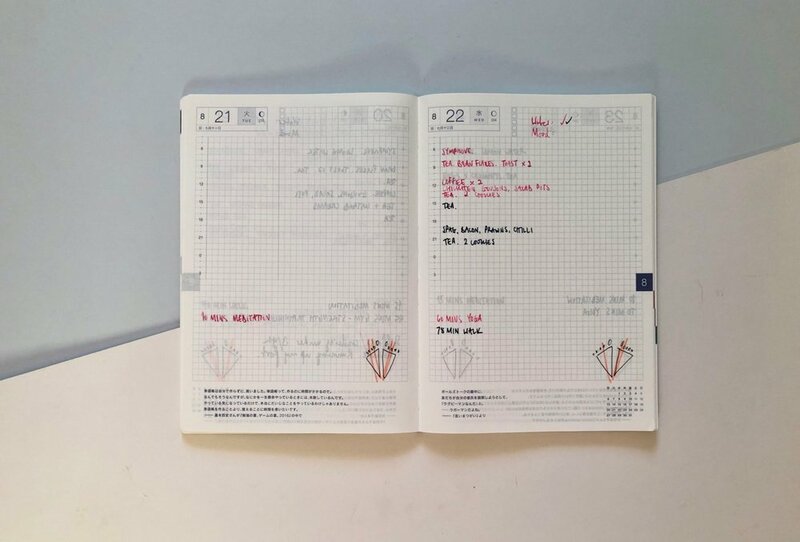 I have used the Travelers Company vertical weekly refill to track how I spend my time and the Jibun Techo shares a similar set-up and format to this. 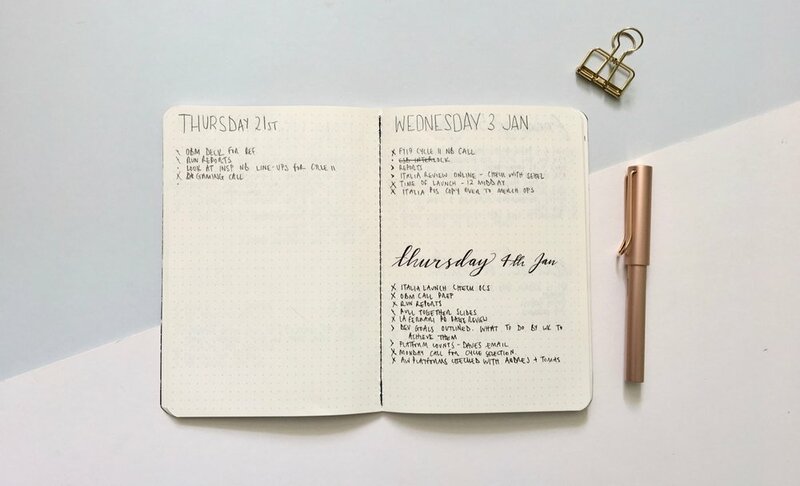 I have also used my own DIY bullet journal in the Leuchtturm1917 to track and plan my time. 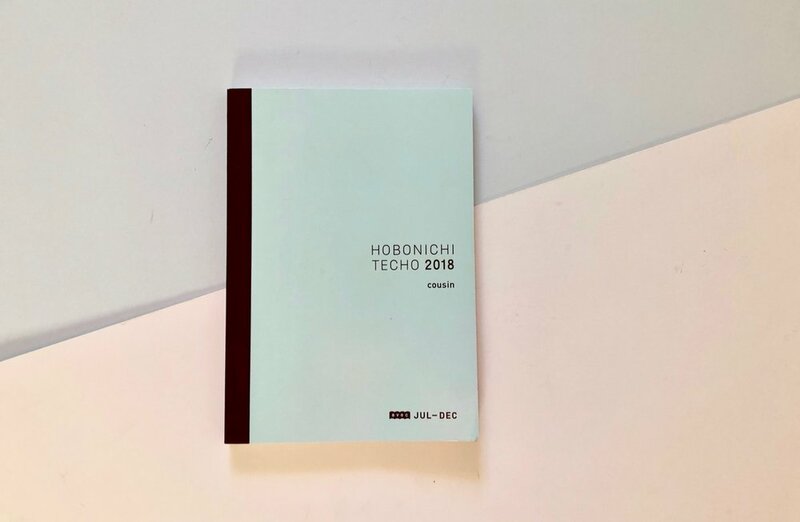 So I am susceptible to change and when planners are involved there is always the lure of something better and something new…but I really do like the Jibun Techo. It’s a great size, the design is nice but the inclusion of the additional, different pages is really nice. I use much more of this planner than I have done on any other before. There are some things that would really strengthen this planner for me. A few more English translations would be very helpful. It hasn’t stopped me using this planner and figuring most things out but I think the final few pages could be used if I knew what they were for. Also a few extra blank pages would really be helpful. There are just 2 at the end of the weekly spreads and honestly I am not sure what you’re supposed to do with just 2 pages. 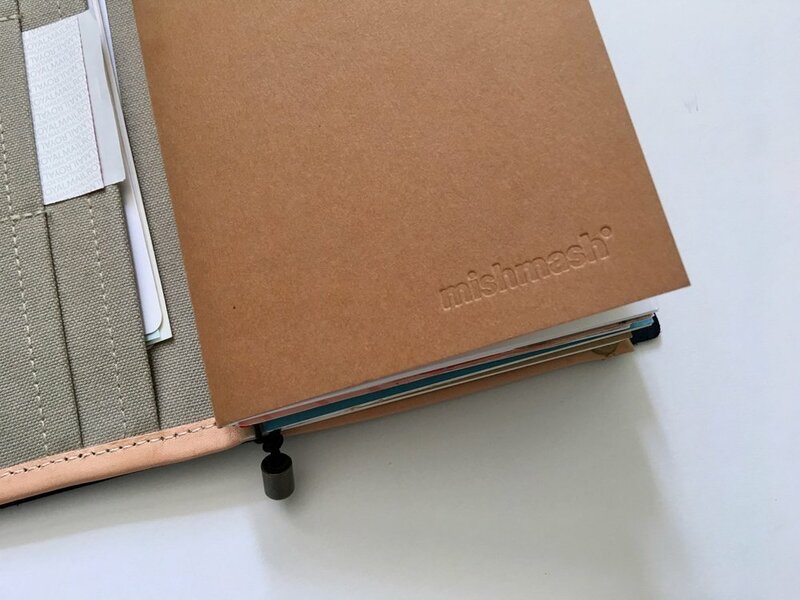 I know the Jibun Techo can be used in conjunction with their larger system which incorporates a blank notebook and a longer term life notebook but for people just using the planner a few extra pages here would really be helpful. Otherwise I really like the Jibun Techo. It’s colourful, slim, practical and has great paper. If you have the time I also rambled on about I use the Jibun Techo in the video below, so please take a look.